I recently had the opportunity to explore popular methods of adding captions to images inside the WYSIWYG editor using the setup of WYSIWYG module with CKEditor library. Our two main criteria were Media module integration and a styled caption in the WYSIWYG editor. As I discovered, we couldn’t have both without custom coding which the budget didn’t allow for. Media module integration won out and the File Entity with View Modes method was chosen. These are the results of the module and method comparisons. A matrix with various properties of each is at the end of the article. Enhanced Image (Image2) is a CKEditor plugin meant to replace the ordinary image plugin. 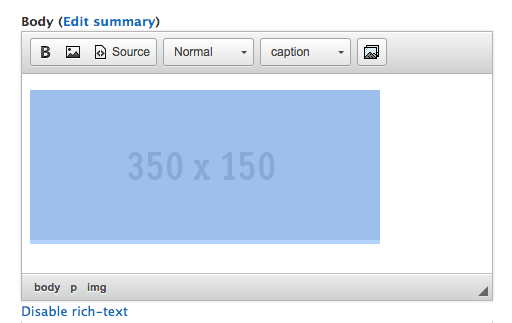 It gives captioning capabilities in addition to center alignment and click and drag resize. The easiest way to install it is to use Quiron’s sandbox project and follow the instructions given. The only deviation I needed to make was to rename the module’s directory from ckeditor_image_captions to ckeditor_image2. What image caption with Image2 looks like in node view by default. It could use some styling. 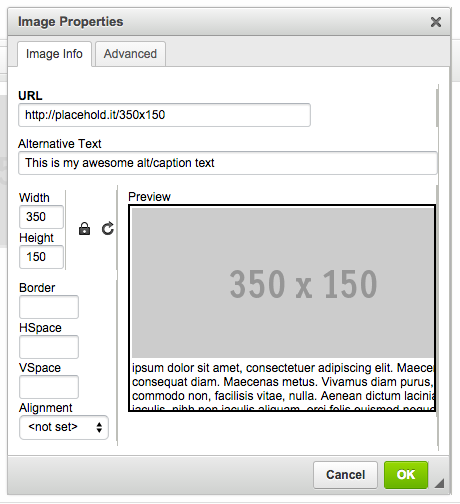 Using caption filter requires working in Source view or disabling the WYSIWYG editor. 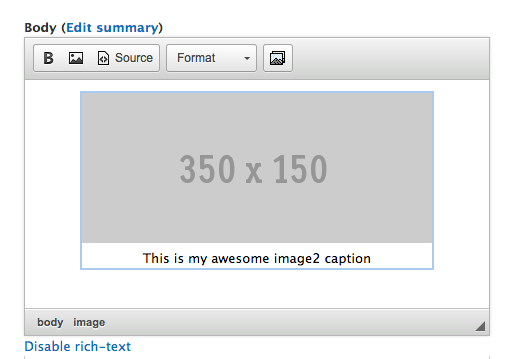 What the caption looks like in WYSIWYG. Tokens are not replaced in the editor. Caption Filter is probably best used without the use of a WYSIWYG. Default styling of Caption Filter’s captions. 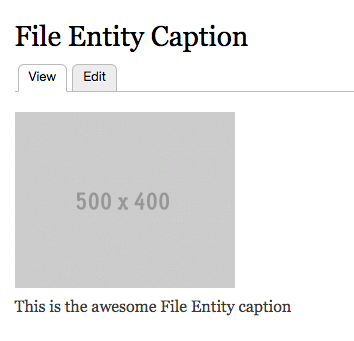 This image caption module uses jQuery to transform the title or alt attribute of an image to an image caption. 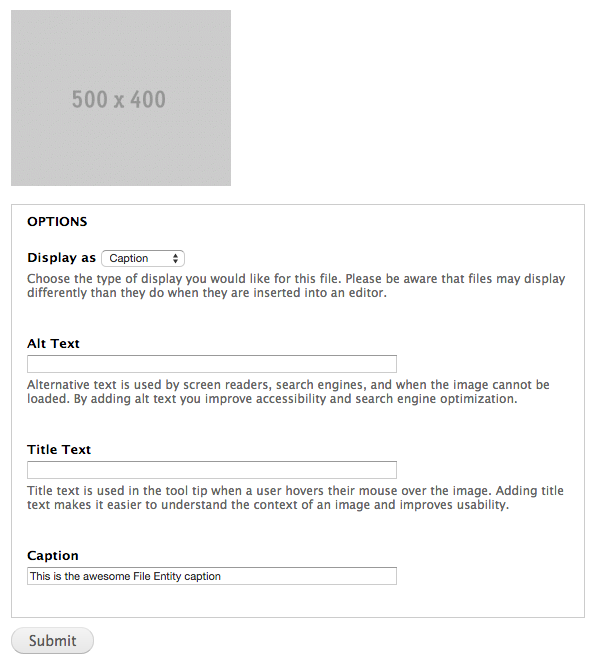 See the JCaption module page for another comparison of the JCaption, Image Caption and Caption Filter modules. 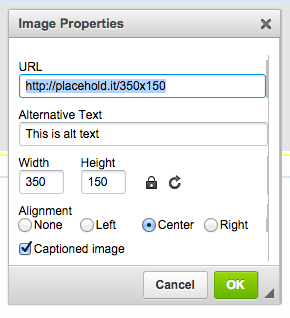 Adding an image with alt text via the CkEditor default image plugin. A view of the image in WYSIWYG editor. The caption is not visible in the editor. With the Image Caption module, an image is added with the usual CKEditor Image plugin, and the caption is added by setting a previously defined class in the Font Style’s dropdown of the WYSIWYG editor. JQuery is used to wrap the image in an html container div and then puts the image title text in a child div underneath the image. 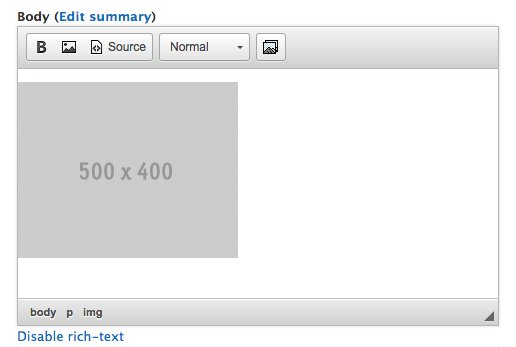 Image inserted into the WYSIWYG. Image displays without caption. Image as seen with Image Caption caption in node view. This method involves the most amount of setup but integrates well with the Media module. It involves adding a caption field to the image file entity, an image style, and a view mode, and configuring the image file display. A step-by-step account of this method can be found at 58 Bits. 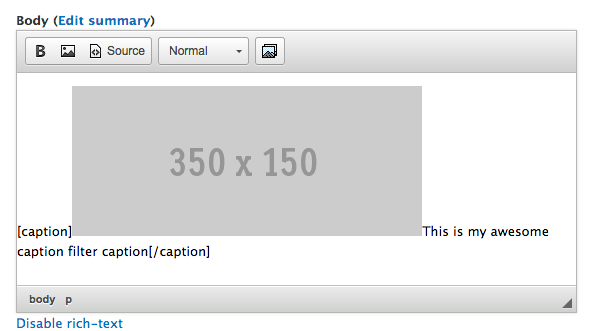 Adding the image and caption via the media browser. Choose the view mode in the “Display as” field and set the Caption field. 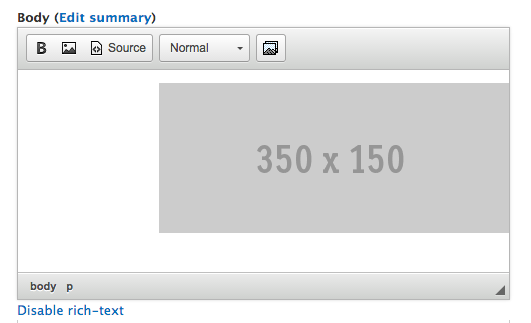 Image in WYWIWYG - no caption visible. Image as seen in node view with no styling. A Comparison of Captioning Modules/Methods. Comparison matrix of captioning modules/methods. Summary: Which Module Do I Use?!? Which module is used is really dependent on the requirements of the project. If you require Media module functionality (maintaining a library of images that can be searched and re-used), the only two options are the File Entity - View Mode method and the Caption Filter module. If your editors are savvy and understand html basics, Caption Filter will give you more flexibility around captions, allowing you to reuse images with different captions tailored to the context. If you need to keep it as simple as possible, doing the extra work of setting up the File Entity and View Modes will make it pretty simple for your editors to add pictures, have them automatically resized, and aligned without any additional work. 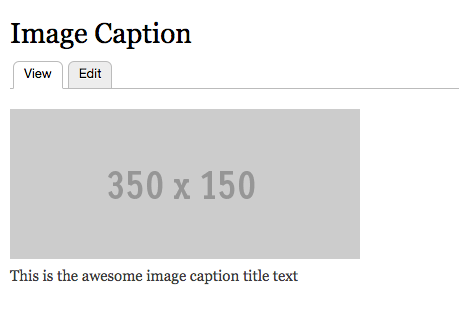 If the Media module is not needed, Image2, JCaption, and Image Caption are all pretty comparable, although I would lean towards the Image2 plugin simply because it gives the ability to center the image and the caption is visible in the WYSIWYG editor. The one thing I would caution against is in the JCaption module. It gives the option of using either alternative text* or title text as the caption. It’s generally not good practice to simply duplicate the alt text (you are adding alt text to your images, right?) for a caption. 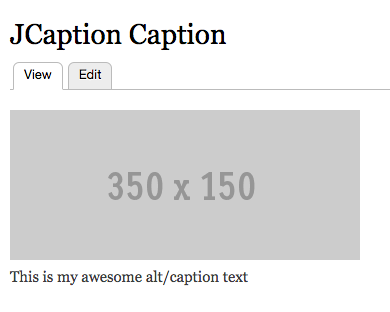 Both the caption and the alt text will be read by screen readers and will be redundant for the user. Using title text as caption text may be less problematic since most screen readers do not read title text by default. *Alternative text (or alt text) is text that describes an image. It gives people who are blind and use screen readers and people who have images turned off due to low bandwidth a description of the image that they can’t see. It is good practice to include alt text for images.